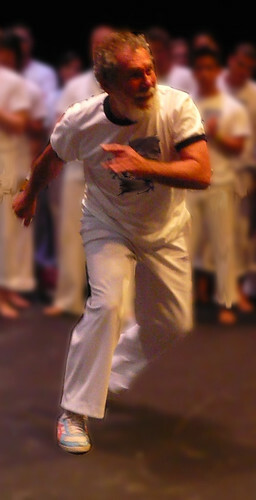 So apparently, a god or goddess in the universe discovered I saved a busload of children, rid Europe of a plague, gave up a multimillion editorial position to feed the poor, and singlehandedly solved the affordable housing crisis in a past life, because recently, I was given a fluke opportunity at a capoeira workshop to meet Mestre Acordeon. It was like Christmas, only replace the sacks of toys with irregularly shaped parcels of capoeira wisdom. What was it like, seeing and hearing a famous—legendary—capoeira mestre in person for the first time? Well, I think that was the first and only time I’ve been “starstruck” by a capoeira mestre. So much so that I actually let the entire first of only two days go by before even just going up to introduce myself! Much of it was because Mestre Acordeon has broken ground (to put it mildly) in all THREE of this blog’s (so by extension, in a way, my) raison d’être: capoeira, gender equality, AND writing/publishing!! For me, meeting Mestre Acordeon was like meeting three stars/role models in one. It was kind of surreal, actually. He told us an anecdote I recognized from one of his articles—and it was the story, told to us firsthand. When he sang—it was the CD track/voice, live in concert. And the capoeira? Well, yes, it was our profesor disarmed and down in three seconds flat. There was one question particularly burning in my mind, and so on the last day, at the end no less (as people were pulling on their jackets and shoes and our teachers were kicking everyone out to avoid overtime rental fees), I slipped myself into a small group sitting on the ground in front of M. Acordeon, storytime-style, listened to the end of a story he was telling, waited out the usual “Look! It’s Mestre and me!” photoshoot, then walked up and introduced myself, and asked my question. Basically, I asked him about the whole “tradition vs. ‘modern-day’ values” issue in capoeira. I described some of the ideas we’d been struggling with here, such as changing capoeira and cultural appropriation, and asked him, essentially, how a capoeirista today can reconcile “modern” values like gender equality without losing the importance of “tradition” in capoeira? I’ve run into this question several times since starting this blog (ex. here and here), and I figured, who better to answer it than a capoeira mestre of M. Acordeon’s reputation, experience, and standing? Change is important, and capoeira has to change, because if something doesn’t change, then it grows stale, and dies. In the end, I decided against asking Mestre Acordeon for an interview even if there had been more time, because while he was talking, it just seemed…like it wouldn’t really be right. Not morally or anything like that, but just in the sense that he took time out of what’s probably an extremely busy life just to come to the workshop, and everybody wants to talk to him when he’s not already surrounded by the other mestres and teachers, and so it didn’t seem quite fair nor courteous to ask for even more of his time, on such short notice, to ask straight-out for answers to potentially heavy questions so I could publish what he said online. Mestra Suelly was the first woman to become a mestra outside of Brazil. As the mestre who graduated her, what reactions or controversy, if any, did you encounter from this? What do you think about all-women rodas, or events? Do you believe they are truly beneficial, or help to perpetuate sexist gender stereotypes in capoeira? Do you think gender equality is a shrinking issue as capoeira spreads in North America and Europe, or if not, what needs to be done to address it? In one of your articles, you mentioned the “extraordinary political potential” of capoeira. I think that is one of the most exciting things to think about in capoeira, but how exactly would someone fully explore or even start to draw upon, I suppose, this potential? What do people actually mean by saying “capoeira is a tool of civilization”, and how do you see this happening today, in real life…or is this something we have to wait for that will come in the future? What do you think it is about capoeira that not only draws so many different varieties of people, but draws them all with the same incredible amount of strength and attraction to the art? My question was going to be along the lines of-What makes someone a mestre…how can you quantify that or should we even try……? Oi Joaninha, I’m glad to hear you had this experience! One thing though… I realize you may be exaggerating on the “starstruck” aspects of the situation… but I’d caution against elevating him to some high unapproachable pedestal, feeling that you’re somehow unworthy of his time. As Soldado pointed out, M. Acordeon (along w/many other mestres – yes, even the famous/legendary ones) are extremely approachable and welcome questions from students. They love the opportunity to interact and share with those who are eager to learn. Heck… just speaking from my own experience: M. Cobrinha freely gives out his e-mail address and encourages people to write… M. Valmir was more than happy to answer my many questions about malicia despite the fact that I was extremely new to capoeira angola and to his group… and M. Joao Grande (legend of the angola world) sat and talked with my friend for an hour when all she wanted to do was buy a dobrao from him! Hey Shayna, and Angoleiro, thanks for the wise words 🙂 Just to reassure you, I was pretty shy/intimidated about going up to introduce myself, etc., but you know I’d be one of the last people to help inflate a mestre’s ego by pedestaling/demi-god-worshipping, etc! 😛 I agree, Shayna, that it was mostly a matter of timing. Perhaps if he’d been there for more than two days…! p.s. I do have to say though, in slightly further defense, that Angoleiro, you said everything is very relaxed in terms of mestres’ interactions with students in capoeira, etc. I think that is very group-dependent! This is covering some old ground from a previous Mandingueira post, but in this specific case, even if M. Acordeon is completely down-to-earth himself, he gets assimilated as someone with mestre status in the group he’s visiting, as their guest. So if that group is used to treating/seeing mestres a certain way, they’ve been conditioned to treat/see all guest mestres the same way. For instance, at this workshop, we literally *were* told to treat all the mestres as kings. Not that I didn’t take that with a huge grain of salt anyway, but you see what I mean.